NTS Pittsfield wrote the book on lightning testing — and it is still in use by NASA and the FAA today. This 20,000 square foot facility is home to generators that are capable of producing over 200,000 amperes and 2.4 million volts. That is why it should come as no surprise that NTS Pittsfield houses one of the most complete lightning-simulation laboratories in the world and ranks as an international leader in the development of sophisticated lightning protection systems for customers in the aerospace industry as well as for industrial complexes, golf courses, wind turbine farms, theme parks and other high-risk locations. NTS Pittsfield’s operations include both14-foot and 25-foot tall generators. Our finite element analysis capabilities allow us to perform complex simulations to accurately model the interaction of lightning with a variety of aircraft and avionics components for our customers. By decomposing complex CAD-generated objects into meshable geometrical shapes, we are able to accurately portray the lightning environment on high fidelity renditions of real objects. Click here to review a detailed article about our CAD / FEA modeling service for lightning. The direct effects of lightning include the physical damage due to the attachment of the very hot (20,000°C) and high current (250,000+ amperes) lightning channel. These effects include the burning and shattering of materials and the direct conduction of lightning voltages into electrical and electronic circuits resulting in burnouts of equipment. Two basic types of generators are used for direct effects testing: High voltage, Marx-type impulse generators produce voltages and electric fields up to 2.4 million volts to simulate lightning leader attachment and surges induced on power transmission lines. The high current generators produce up to 250,000 amperes and include three units adapted to duplicate the lightning stroke, and intermediate and continuing current waveforms of a typical lightning strike. To accommodate very large test specimens, direct effects tests are performed in facilities like Lightning Technologies’ indoor high-bay laboratory that measures 80 x 100 feet. The indirect effects of lightning are caused primarily by earth-voltage rises that occur when the flash dumps charge into the earth and by the intense electromagnetic field associated with the flash. These fields and earth-voltage rises have enough energy to cause component damage up to a kilometer or more from the actual strike. Indirect effects are most commonly induced into system interconnecting cables and may damage or upset electronic components. The staff of LTI and NTS have been at the forefront of indirect effects test method development for many years. These methods are defined in IEEE, ANSI, SAE, EUROCAE, US MIL-STDs and many industry and company standards and specifications. 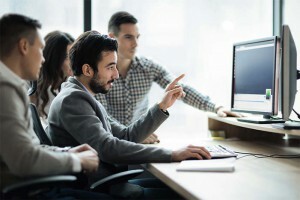 The indirect effects testing lab includes many specialized devices for complete field and transient analysis, from the level of individual circuits to completely operational interconnected systems. Typical indirect effects tests include pin injection, transformer injection, capacitive injection, ground-circuit injection and field immersion techniques. NTS engineers and technicians are recognized experts in the field of lightning protection. The electrical characteristics of the different types of lightning flashes, and the resulting surges and fields from a strike, are complex. Engineers have found that to study the effects of lightning upon a structure or system, it is most efficient to isolate the components of the lightning waveforms and electrical/magnetic fields and to evaluate their effects through individual simulations. Our lab includes specialized and unique equipment to simulate all the electrical characteristics of natural lightning as well as the transients it induces in electrical and electronic systems. From avionics to military equipment, our lightning testing gives manufacturers the data they need to produce robust components and systems designed to remain operational even when surges resulting from lighting strikes occur. The flickering seen in a lightning strike to ground actually is caused by a series of current strokes, the electrical characteristics of which are called multiple stroke. On the other hand, inter- and intracloud lightning has very difference electrical characteristics, referred to as multiple stroke and multiple burst, and require that aerospace electronic systems that perform critical or essential functions be tested against the effects of both types of lightning. We have the most versatile facility for both multiple stroke and multiple burst testing. Staff members are active in industry standards organizations, including SAE Committee AE2, EUROCAE WG 31 (Aircraft); and IEC TC 88 PT 24 (Wind Turbines), and several have been the recipients of awards and professional society fellowships for their work in this technology area. 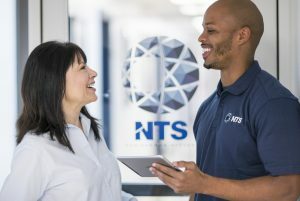 Since 1961, NTS has been at the forefront of providing organizations and their projects with the expertise required to develop systems that have robust lightning protection built into their designs. Regardless of your location, we’re happy to provide on-site assistance to meet the lightning protection needs of your facility and/or project. 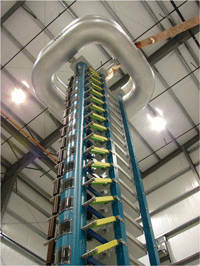 We perform many types of static electricity and electrostatic discharge (ESD) tests. For ESD testing, we can generate electrostatic discharges ranging from 8 to 300 kV, which satisfies the requirements of MIL-STD-331, -464, DO-160 and more. For testing procedures that simulate the range of static effects — from those occurring on aircraft that can exceed 100,000 volts to the small, but potentially hazardous voltages, produced by manufacturing and material handling operations — we have both the equipment and experience to get you accurate results in a timely and cost-effective manner. We regularly perform a wide variety of indirect effects verification testing at customers’ facilities around the world. Click here to download the NTS Pittsfield fact sheet for more details on specifications, tests, and capabilities. Contact us today to discuss your next program!